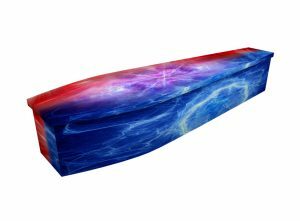 See below for a range of more abstract and artistic pictorial wooden coffin designs – ranging from cherubs and angels to colourful plasma. 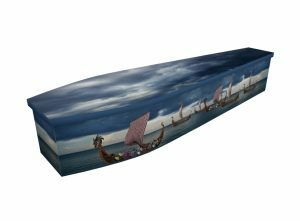 Designs for our wooden coffins are printed directly onto the wood, eliminating the need to wrap the surface in vinyl or other printed material. 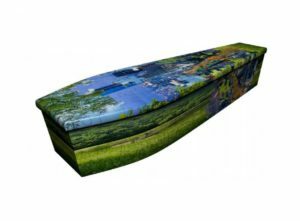 We cater to everyone’s personalities and tastes, so if your loved one would have appreciated a more unusual or abstract wooden coffin design, our team will be delighted to work with you in creating a fitting memorial. Alongside the weird and wonderful coffin designs below, we can create a bespoke wooden coffin for you. From the artistic to the truly off-beat, we have the flair and experience to produce almost any design you have in mind. 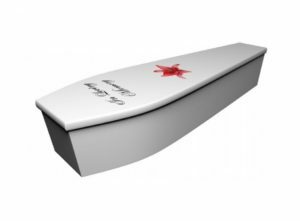 Contact our design team today to discuss your ideas. Our art studio manager Jonny and his dedicated team will set about creating a visual proof within 24 hours of receiving the brief. 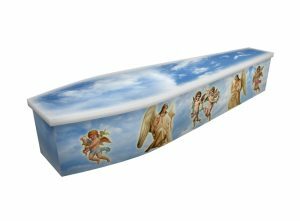 Once you’re happy with the design, we will work towards delivering the completed coffin to you within the next 72 hours.